Plastic bottle without the plastic Written on March 15, 2011, by Ingeborg. Breaking: PepsiCo makes a petroleum free soft drink bottle. Not made from the regular non-plastic plastic and often gen-moderated corn starch, but with raw materials as switch grass, pine bark and corn husks. 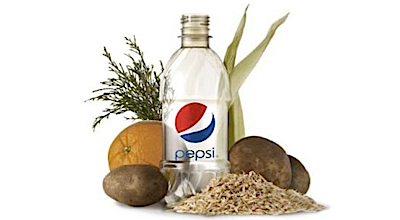 How about by-products from Pepsi’s food businesses (potato peels from chips, orange peels from juice) as material? Read more from the Cradle to cradle category. Stay up to date via RSS , or Trackback from your site.